Synonymous with the best that life can offer, Switzerland is a country that has captivated me since childhood. With its melange of stunning natural landscapes, its endless sightseeing activities, and its plethora of refined pleasures, this is a destination meant for those seeking experiences found nowhere else. From the relaxed Italian influenced region of Ticino and the lavish lifestyle of St. Moritz to the unequivocal financial hub of the world, Zurich…Switzerland lives up to its reputation. Besides, where else can one rub elbows with the rich and famous, soak up million-dollar views of the Alps and relish in a purely addictive gastronomy scene, all within a few hours? Considered to be the Mediterranean soul of Switzerland, charming Ascona, in the region of Ticino, is everything that it promised to be. Located just two hours north of Milan, Italy, this postcard-worthy town delivers on its la dolce vita (the sweet life) mentality! Never would I have thought that I would be exposed to distinct features of two countries so beautifully woven together. The Italian flair for life marries quite well with the stunning beauty of Switzerland’s panoramic view of never-ending glacial mountaintops. And it’s with good reason that this region’s motto is ‘Swiss excellence meets Mediterranean passion’. Filled with culture and zest, Ascona is much more than just a chic party village; it has character and a great deal of history. At the piazza, located around the stunning Lake Maggiore, you are encouraged to lounge by the sprawling palm trees and indulge in an Aperol cocktail or two at one of the endless bistros. It is a place where one can easily ‘live in the moment’. Case in point, while on a boat ride around the lake to enjoy the afternoon sunset, I basked in the sun as its rays danced on the water and watersport enthusiasts took full advantage of the warm temperature. Activities are endless in Ascona, the region seems to have everything you could possibly want or imagine. For water lovers, there are sailboats and motorboats aplenty, if you want to try your hand at being Skipper of Ascona, or you can take pleasure in the favourite pastime of most locals—swimming in the river. Actually, it is very common for men and women to go for afternoon swims in the river during their lunch break and then return to work. This is la dolce vita mentality at its best! One of my favourite discoveries in Ticino was the grottos, which have become famous in this region of Switzerland. In fact, grottos were used to preserve cheese and cured meats as these stone cellars were, and still are, very cool—perfect for hot summer days. Some of the grottos reminded me of the old prohibition taverns, with secret rooms, around every corner, each with its own allure and history. Grotto charm wouldn’t be complete without being immersed in their enchanting views, lakeside or mountainside, while you indulge in the plethora of delicious Mediterranean-style dishes. 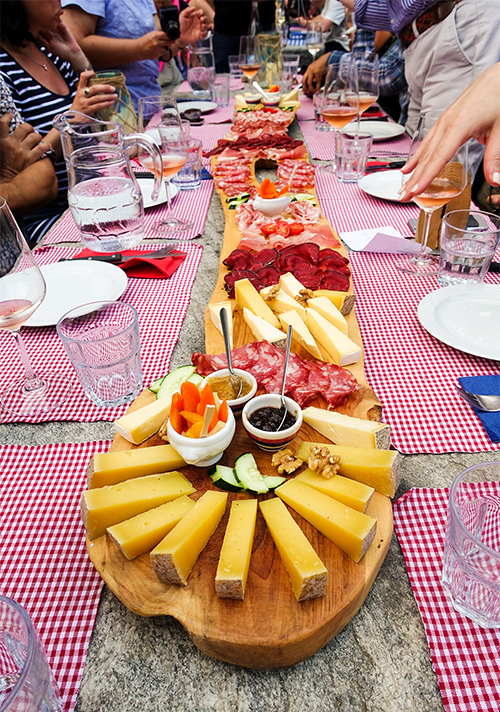 Foodies will enjoy the Southern Switzerland palate, from savoury risottos and cured meats in a rustic grotto to the haute cuisine of multi-starred eateries. The la dolce vita vibe of enjoying life wouldn’t be complete if a stay at the five-star Hotel Eden Roc Resort wasn’t included. This resort, with its unrivaled lakeside view, is situated on a private marina with its very own luxury boat charter in addition to its range of motorboat, sailing and water-ski schools. For those that enjoy hitting a few rounds of golf, there are two 18-hole golf courses in the immediate vicinity. And, my favourite, Eden Roc spoils its guests with its award-winning cuisine showcasing locally sourced seafood. Now, doesn’t that sound like it’s a piece of paradise? Stylish and exclusive with a true cosmopolitan flair is how the world perceives this famous holiday destination. St. Moritz, located 1,800 metres (5,910 feet) above sea level, is a luxury alpine resort town in the heart of Switzerland’s Engadin Valley. Known for its downhill skiing and the ever-so chichi activities of polo, cricket and horseracing on its frozen lake, this town has plenty to offer even during the summer months. It was love at first sight when my eyes took in the stunning landscapes of the majestic Alps, its turquoise-coloured rivers and endless forest trails. From Alp hiking with its huge array of trails for both ambitious mountaineers and purely recreational hikers, to trying something a bit more relaxing yet still exhilarating, gliding or sailing on a sailboat to admire the vistas of Lake St. Moritz, vacationers can experience the beauty from every angle, if they wish. Bewitchingly beautiful and impressively challenging, the Swiss Alps provide the ultimate setting for breathtaking hikes. Seeing that I couldn’t pass up the opportunity of experiencing the Alps up close and personal, I took a funicular up to where I started my hiking tour. If you’re in need of motivation, there are several eateries waiting for you at several resting areas up the mountains where you can indulge in a libation or two, accompanied by some decadently rich traditional Swiss dishes. Speaking from experience, this is a well-deserved break from all that exercise! However, the pièce de résistance of my climb was to touch a patch of Alps snow. Having endured plenty of snowstorms in my life, the sight of snow on this mountain was a rush! Now you’re ready for some pampering. Via Serlas, the main street in St. Moritz, is synonymous with Rodeo Drive in Los Angeles or the Champs Elysées in Paris. The village offers trendy, not to mention exclusive, shopping opportunities with brand names you never knew existed, chic art galleries, the famed Casino of St. Moritz and much, much more. To continue my indulgent ways, I was fortunate to stay at the uber-luxurious Badrutt’s Palace Hotel. This isn’t a hotel, but rather is a real palace. A palace that caters to your wishes before you can even say them in a whisper. With its 157 rooms, 37 of which are suites or junior suites, Badrutt’s makes guests feel like they are the only guest in the palace where everyone is catering to just them. In the hospitality business for more than 120 years, the attention to detail given to both the clientele and to their services is beyond outstanding. All of their restaurants, several of which are seasonal, offer their own specialized cuisine, including Classic Swiss, French, Japanese, Peruvian and Mediterranean. And, if being driven around in their fleet of Phantom Rolls Royces wasn’t enough, the palace outdoes itself with their spa facility, Palace Wellness. This spa is unlike any other spa; it was designed to enhance your state of well-being. After hiking in the Alps and cycling in the forest trails to nearby villages, this body was in need of some special attention, and their spa facility succeeded tenfold. The best of the best treatments are offered to make you feel nothing but pampered in this fairy-tale destination. This led me to my ‘life is pretty good’ introspection. For several days, Badrutt’s Palace Hotel, rich with history and tradition, made this princess feel like she had found her home. Visiting Switzerland wouldn’t be complete without exploring its largest city and the world’s financial epicentre, Zurich. Travellers will enjoy the country’s pre-medieval past while walking along the ancient cobblestone lanes and taking in the sites. Boutiques selling locally sourced products and quaint bistros add to the historic city’s charm. Distributed amongst the many districts in Zurich, exquisite chocolate shops and cheesemongers entice passersby with their delicacies. Each shop is keen to showcase their specialty, and let me tell you, they are always happy to provide samples…a sweet and savoury delight that cannot be missed! As with any large cosmopolitan area, there are many familiar activities for tourists. Everything from discovering local products at the weekly market at Bürkliplatz (a town square in Zurich), visiting the Rietberg Museum (the only art museum of non-European cultures in Switzerland, displaying Asian, African, American and Oceanian art) to enjoying the sights at Lindenhof hill, a public square that provides some of the most stunning views of the city. To have the full Zurich effect, travellers must splurge on a round-trip boat ride around Lake Zurich as it provides a picturesque view of the city and its surroundings. You can enjoy a glass of rosé as you bask in the city’s warmth, completing the perfect excursion of this vibrant metropolis. Zurich has many stunning upscale hotels from which to select. I was spoiled by my stay at the delightful Hotel Atlantis by Giardino, which is referred to as an urban pulse close to the rhythm of nature. It is also referred to as a metropolitan oasis minutes away from the city hustle that ‘swings between urban and nature, finding the perfect balance’. A lush, green space, accentuated by blooming flowers and herbs, provide the right ambiance for guests to come and enjoy the hotel’s outdoor spa facilities. As for the hotel’s culinary offerings, there are two impressive restaurants, including a two-Michelin-star restaurant, Ecco Zurich. Hotel Atlantis not only delivers on taste and flavour, but also on their high-calibre dining service—both at the front and back of the kitchen. This contemporary urban hotel successfully provides guests with the feeling of being in a nature retreat while being in proximity of one of Europe’s most vibrant cities. This was a contrasting voyage in all regards. From the swaying palm trees and Italian flare of Ascona to the icy glaciers and indulgent lifestyle of St. Moritz, as well as the chocolate- and cheese-loving financial districts of Zurich, Switzerland, hits all the right notes, even with the most discerning world travellers. Swiss Air offers direct flights to Zurich from several Canadian cities. Visit: www.myswitzerland.com for more information about Switzerland and experiences to enjoy. Train travel in Switzerland is extremely efficient. You can purchase individual tickets or an assortment of Swiss Travel passes that cover trains, buses and boats. **This article was first published in the lifestyle magazine Luxe Magazine and was given permission to post on the author’s site. Living and traveling in Switzerland, is top on my culinary favorites. I couldn’t agree more with you, Switzerland has so much to offer!! A cuminary experience is Living, working and traveling in Switzerland.